The Valley Flyer pulls into the Santa Fe's Fresno yard. "Drumhead" logos such as this often adorned the ends of observation cars on the Valley Flyer. 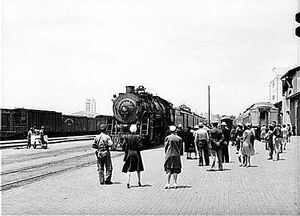 The station platform at San Diego in the early days of World War II. The Valley Flyer, filling in as train No. 70, the San Diegan, is at the right. The Valley Flyer was a short-lived named passenger trains of the Atchison, Topeka and Santa Fe Railway (AT&SF). The all-heavyweight, "semi-streamlined" train operated between Bakersfield and Oakland, California (through the heart of California's San Joaquin Valley, hence the name) during the 1939–1940 Golden Gate International Exposition (also known as the 1939 World's Fair), located on "Treasure Island" in San Francisco Bay. Motive power consisted of a pair of aging, Baldwin Locomotive Works-built 1300 class type 4-6-2 "Pacific" steam-powered locomotives refurbished and specially-decorated for the train. It was the Santa Fe's first attempt at streamlining older steam power. The locomotives had metal skirting applied along the sides, which was painted aluminum (as was the nose and smokestack) with red and yellow stripes, these being outlined by black pinstripes; the tenders were similarly decorated. A yellow "Circle and Cross" emblem backed by red "wings" was emblazoned across the front of the locomotive above the pilot deck, and on each side of the tender, which also featured a red "wing." The air-conditioned rolling stock was painted completely in aluminum, and had red and yellow stripes running along their sills, bordered with black pinstripes (somewhat akin to those found on Santa Fe's passenger diesel locomotives). Stripes on the combine unit spilt into two sets, with one set sweeping up to align with those on the locomotive tenders. Window shades were painted matte aluminum. The sides of the passenger cars bore the words "SANTA FE" in black, extra extended Railroad Roman letters. The design of the Valley Flyer's "drumhead" was inspired by that of its counterpart, the Golden Gate. Operation commenced on June 11, 1939. 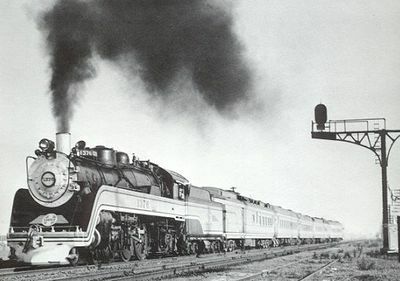 The train left Bakersfield daily at 6:30 a.m. and arrived in Oakland at 12:35 p.m., then returned south at 1:55 p.m., pulling into Bakersfield station at 8:00 p.m. Beginning on October 27, 1941 the Flyer (save for the lounge car) was used to transport troops as a section of the San Diegan on the Santa Fe's "Surf Line" run between Los Angeles and San Diego. In 1942, the trainset was discontinued and the passenger cars returned to pool service and repainted "Coach Green." The locomotives' black paint was restored and the running board panels removed. The motive power units alternated service. 1369 was sold for scrap on November 6, 1951, and #1376 was likewise sold on August 22, 1950. ↑ Jordan, pp. 66, 68: The steam-powered, all-heavyweight consist was headed by 4-4-2 Atlantic type locomotive No. 1369 and included three coaches, a lounges, and a baggage-club car. A diner was added in 1941. This page was last modified 03:50, 1 October 2014.